From corsages for the high school prom to showy centerpieces for formal dinner tables, colorful orchids are in big demand. As a result, orchid culture has taken off over the last few decades, as growers using new techniques have learned to scale up production, churning out millions of genetically identical plants through a process called cloning. As NATURE’s Obsession with Orchids shows, cloning allows breeders to turn one plant into thousands, by harvesting a few cells from root tips and growing them in carefully prepared petri dishes. As the clump of tissue grows, breeders can divide it into separate plants, dramatically reducing production costs. As a result, orchids that were once a sign of wealth have become available to almost everyone. One beneficial side effect of the orchid boom is reduced pressure on wild populations from collectors, who once were primary suppliers to plant shops and collectors. That doesn’t mean overcollecting isn’t a problem in some cases: wild populations of Vietnam’s rare lady slipper orchid, for instance, may have recently succumbed to overzealous pickers. But in most cases the major threat to orchids comes from habitat destruction. 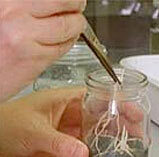 Many researchers are cloning orchids. In the United States, for instance, the western prairie fringed orchid is threatened by the loss of intact prairies and pesticide use. The flower may grow up to four feet tall and have up to two dozen creamy white fringed flowers. Its pollinator, the long-tongued hawk moth, comes by night, attracted by an intoxicating scent. The moth “is unremarkable in appearance and coloration,” says Kathy Martin, a botanist with the U.S. Fish and Wildlife Service in Bismarck, ND. “What’s unusual about it is its uniquely evolved tongue for harvesting the orchid’s nectar.” As the moth hovers with its long tongue extended into the orchid, two specialized pollen-bearing structures brush pollen onto the insect’s eyes. But today, only 2 percent of America’s tallgrass prairie remains, along with less than 40 percent of the original western prairie fringed orchid populations, Martin says. And pesticides drifting from nearby cropland pose a threat to hawkmoths. 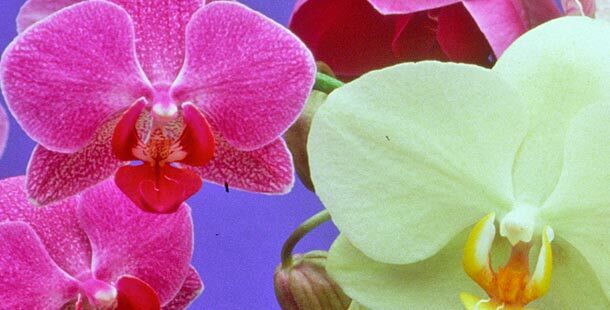 As a result, the orchid was listed as a threatened species under the Endangered Species Act in 1989 — making it one of nearly 2,000 endangered orchids worldwide. Luckily, the growing interest in greenhouse orchids has also translated into greater interest in conservation. In the case of the prairie fringed orchid, conservationists are working to establish hawkmoth “corridors” of native prairie between orchid populations. And in isolated orchid preserves tens or even hundreds of miles apart, they are considering pollinating the flowers by hand. In the end, they hope that such human “flower power” will pay off with survival.